If your print or shirt is somehow defective, Happy Capybara is more than happy to offer a FREE replacement shirt as long as you have contacted us within 30 days of receiving your order. 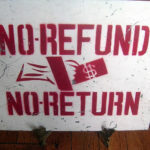 Unfortunately, since we custom print our shirts and merchandise for you, we are unable to offer a refund for items for reasons such as the incorrect size being purchased. Please consult the size chart included on each product page to ensure your product will fit.